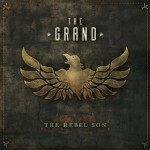 Share the post "Album review: THE GRAND – The Rebel Son"
‘The Rebel Son’ is a marvellous debut by a Canadian southern rock band called The Grand and should be sought out by all heritage and general rock fans alike. Sometimes as a reviewer and broadcaster the time between a review, or a play list and the subsequent audience reaction can be excruciating. Every trickle of positive feedback seems to take a lifeline to connect the solitary soul with the big wide world outside the critic’s fishbowl. Not that this excellent the Grand’s CD/EP needs any further confirmation of its quality beyond the several repeat plays it’s already had. Given the number of CD’s and digital releases passing my desk each week, its not often an EP/CD makes such an immediate impact. But such is the case with ‘The Rebel Son’ which belatedly made it into my ‘Best of 2014’ list. Unfortunately this review has taken longer to surface, but it’s presented here in the hope that it will still have a positive effect, even as news reaches me that this excellent southern rock band from Vancouver are taking a break after 4 years of building up their profile in their native Canada. ‘The Rebel Son’ CD/EP is an amalgam of subtly crafted passionate songs, full of booming hooks, great harmonies and bristling dynamics, all played with real intensity and succinctly wrapped up in a sparkling production. It treads a careful path between rip roaring southern rock and a commercial undertow and The Grand deliver their material with all the power and intensity that rock and roll demands. From the booming chorus of the opening ‘Boondock Crew’ to the surprising low key, but nicely rounded finish of ‘Quicksand’, you’re hooked by a band that uniquely redefines southern rock from a Canadian perspective. All the elements are there from Dallas Norrie’s opening gutteral grunt to the defiant chorus of the title track (shorn of its definitive article), which sets the standard and ignites the CD’s unrelenting drive. Confused by the weird mix of musical genre and geography? Don’t be. Immerse yourself in a roller coaster musical ride rooted in southern rock, but shaped by the crossover appeal of Nickelback. In retrospect, had their fellow Canadians Nickelback not beaten them to the punch by a decade, The Grand would now be headlining coast to coast. No surprise then that the very catchy ‘Back Roads’ is mixed by Randy Staub whose credits include Nickelback, Bon Jovi and AC/DC. But whatever the influences, there’s no denying the compelling Celtic flavour of an anthemic song given its urgency by Dallas Norrie’s magnificent vocal. He spreads his fervent phrasing over a stop-time pause before a hypnotic chorus. I can’t remember such a memorable opening brace of tracks in recent times. The Grand admirably live up to their name with a contemporary take on southern rock that a raft of southern rock bands would kill to have written. By the time they take a step back from their ball busting intensity on the first of two drink related titles on ‘Me or the Bottle’, they settle on a mid-tempo arrangement which gracefully glides towards another infectious chorus, full of lush harmonies and an enveloping melodic sweep. The subtle production touches include stop-time dynamics, soaring bv’s and a glistening layered sound that gives it radio potential. Or perhaps not, as sometimes it sounds just a touch too perfect and familiar and too close to what already exists? That said, songs like ‘Raise Your Glass’, bristle with compelling dynamics, an intricate production and an uplifting hook that drags you into the slipstream of a raucous hoe-down. Vancouver melodic popster Shylo Sharity joins Dallas Norrie on an emotive duet ‘Quicksand’, which is framed by Ryan Stead’s acoustic and suggests the band never stray too far away from commercial possibilities. It’s hard to believe that this country tinged duet is from the same southern rocking session that has gone before. The combination of heartfelt phrasing, layered chimed notes and pedal steel draws the listener in to nicely round off a stellar release. If nothing else, ‘The Rebel Son’ shows they are capable of delivering essential southern rock while brushing the mainstream. This entry was posted in ALBUM REVIEWS, ALBUM REVIEWS (Mobile), All Posts and tagged AC/DC, album, Bon Jovi, Canadian Rock, Dallas Norrie, Nickelback, Randy Staub, review, Ryan Stead, Shylo Sharity, southern rock, The Grand, The Rebel Son. Bookmark the permalink.